The engine used on the Pony was a four cylinder Continental N62. It was gasoline-ran and liquid cooled, and had natural aspiration. The three-speed transmission was unsychronized, and had one reverse speed. When tested, there were 10.43hp at the drawbar and 11.62hp at the belt. Manual steering was the only steering option on the Pony, and the brakes were differential mechanical contracting bands. where can I find cultivaters for my 1952 pony ? I lost the serial number for my Pony tractor. I am wanting to sell it now and now looking for a serial number. Rusty Acres Ranch go to web site under MH pony engine part. They have used carburetors. My serial number reads PGA1282 – can anyone please tell me what year it is? Can anyone tell me what year serial # PGA 12022 on a Massey Harris Pony. Does this tractor look like a 1947 Massey Harris Pony? I have two Massey Harris Pony Tractors for sale. One is 1949, and the other a 1952.I parked the 1949 when the starter motor gave out, and parked the 1952 when the carburater gave out. The 1952 was rolled by the previous owner and the steering wheel shaft is bent but replaceable.Will sell one, or both for a decent price. Would also deliver to Western states of Washington, Oregon, California, Montana, and I Idaho, and western provinces of British Columbia, Alberta, and Saskatchewan for fuel recovery, trailer rental, etc. If interested, contact me for more information and pictures at bomac@shaw.ca Thanks. I am located on the Canada/U.S border 35 miles south of Vancouver, British Columbia. Hi Karen It appears your Pony is a 1950. Serial Numbers PGA 10817 to 13725. I was thinking of selling my Massey Harris pone how much are they worth? I have a pony not sure of the serial number. The number I found is 851651M1. Is this a serial number? I have a 1948, #PGA 3160, has a loader and runs and drives great. How much do you think it’s worth? Paint is slightly faded, starter has been rebuilt. 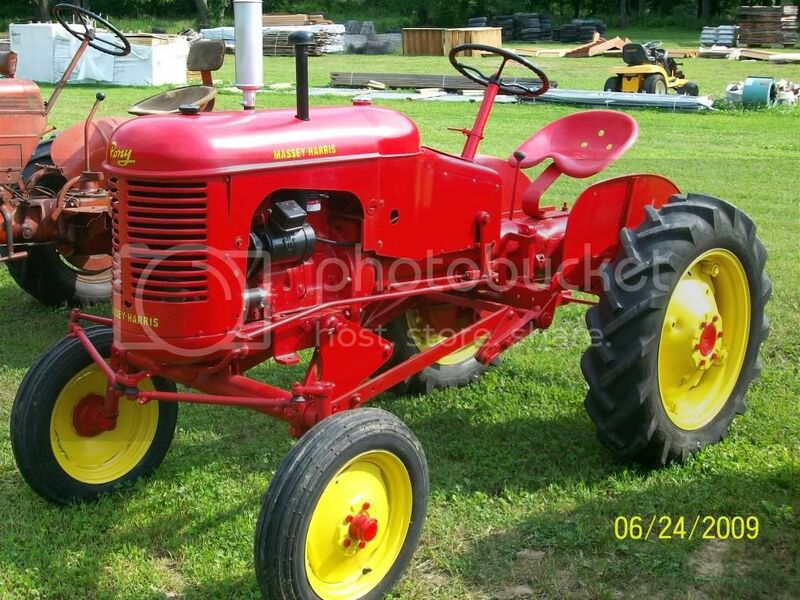 I have restored a Massey Harris Pony 1951 or 52 possibly for sale. I was in a tractor club several years ago and I did 90% of the work myself. I took it down to the last nut and bolt, cleaned it , primed it and coated it with two 2 coats of paint. The motor was rebuilt, new tires, new carbuerator, new side panels, and new battery. It has a few leaks I have not tried yet to stop. I am not a mechanic so I haven’t got the carb completely adjusted yet but it runs great sitting idle. I have over $10,000 in it but I know I won’t near that amount so I am open for offers. I recently purchased a Massey Harris tractor but i’m not sure what it is. I have found lots of sites with numbers but i’m not finding mine. my serial number is 764795 M1 A1403 it stamped in the left side like under the clutch pedal. Any help would be greatly welcomed. Selling my 1949 Massey Harris ( RESTORED ) Pony, great condition. I have the following MH Pony implements that I would like to sell in Michigan. Wanting to know what year my Massey Harris – Ferguson Pony tractor is ? Have posters stating ” First all gray Pony Tractor” Wondering how much it might be worth ? I’ve been looking for accessories for my pony for some time. Interested in MH Pony attachments package. Interested in your package of Massey Harris Pony implements. We just bought a ’53 Pony (#23078). Can anyone recommend a tractor restorer in the Northeast? I am looking for Pony Tractor equipment, belly mower, plow, cultivator, etc. Please e-mail prices and location. Where can I fine a Manuel for 1951 Massey Harris pony? Looking for a hydraulic valve handle for a Massey-Harris Pony. Prefer version without the knob at the top. Looking for top half of carburetor #TSV-24 66E for Pony. I have a Massey harris pony for sale,it runs and operates really good,all the sheet metal is in great condition and it is all original,all the lights and gauges all work as they should,it comes with the plow and attachments, tires in good condition,dent free and rust free,if interested call me at 74051seven 2three01 2three01, I live in South eastern ohio,thanks. I have a French Pony, serial numbers are different, but mine is 2315. Any ideas how old anyone. There is an adapter plate between the engine and the “cast Iron” front chassis, engine is Simca. I need engine parts too.